Minneapolis–Saint Paul is a major metropolitan area built around the Mississippi, Minnesota and St. Croix rivers in east central Minnesota. The area is commonly known as the Twin Cities after its two largest cities, Minneapolis, the most populous city in the state, and Saint Paul, the state capital. It is an example of twin cities in the sense of geographical proximity. Minnesotans living outside of Minneapolis and Saint Paul often refer to the two together (or the seven-county metro area collectively) as "The Cities". There are several different definitions of the region. Many refer to the Twin Cities as the seven-county region which is governed under the Metropolitan Council regional governmental agency and planning organization. The Office of Management and Budget officially designates 16 counties as the "Minneapolis–St. Paul–Bloomington MN–WI Metropolitan Statistical Area", the 16th largest in the United States. The entire region known as the "Minneapolis–St. Paul MN–WI Combined Statistical Area", has a population of 3,946,533, the 14th largest, according to 2017 Census estimates. Minneapolis was influenced by its early Scandinavian and Lutheran heritage. Saint Paul was influenced by its early French, Irish and German Catholic roots. Passenger travel hit its peak in 1888 with nearly eight million traversing to and from the Saint Paul Union Depot. This amounted to approximately 150 trains daily. Before long, other rail crossings were built farther south and travel through the region began to decline. In an effort by the rail companies to combat the rise of the automobile, some of the earliest streamliners ran from Chicago to Minneapolis/Saint Paul and eventually served distant points in the Pacific Northwest. Today, the only vestige of this interstate service comes by Amtrak's Seattle/Portland to Chicago Empire Builder route, running once daily in each direction. It is named after James J. Hill, a railroad tycoon who settled on Summit Avenue in Saint Paul at what is now known as the James J. Hill House. Like many Northern cities that grew up with the Industrial Revolution, Minneapolis and St. Paul experienced shifts in their economic base as heavy industry declined, especially in the 1960s and 1970s. Along with the economic decline of the 60s and 70s came population decline in the central city areas, white flight to suburbs, and, in the summer of 1967, race riots on Minneapolis's North Side. By the 1980s and 1990s, however, Minneapolis and Saint Paul were frequently cited as former Rust Belt cities that had made successful transitions to service, high-technology, finance, and information economies. The Minneapolis–Saint Paul metropolitan area, or The Cities, includes 16 counties, of which 14 are in Minnesota and two in Wisconsin. There are approximately 218 incorporated municipalities within the Twin Cities metropolitan region. This includes census-designated places along with villages in Wisconsin, but excludes unincorporated towns in Wisconsin, known as civil townships in other states. Estimates are as of 2016 for cities with 25,000 or more inhabitants. The Minneapolis–St. Paul, MN–WI Combined Statistical Area is made up of 19 counties in Minnesota and two counties in Wisconsin. The statistical area includes two metropolitan areas and three micropolitan areas. As of the 2010 Census, the CSA had a population of 3,684,928 (though a July 1, 2012 estimate placed the population at 3,691,918). The CSA definition encompasses 11,132.44 sq mi (28,832.9 km2) of area. Minneapolis and Saint Paul have competed since they were founded, resulting in some duplication of effort. After Saint Paul completed its elaborate Cathedral in 1915, Minneapolis quickly followed up with the equally ornate Basilica of St. Mary in 1926. In the late 19th and early 20th centuries the rivalry became so intense that an architect practicing in one city was often refused business in the other. The 1890 United States Census even led to the two cities arresting and/or kidnapping each other's census takers, in an attempt to keep either city from outgrowing the other. The cities' mutual antagonism was largely healed by the end of the 1960s, aided by the simultaneous arrival in 1961 of the Minnesota Twins of the American League and the Minnesota Vikings of the National Football League, both of which identified themselves with the state as a whole (the former explicitly named for both Twin Cities) and not with either of the major cities (unlike the earlier Minneapolis Lakers). Since 1961, it has been common practice for any major sports team based in the Twin Cities to be named for Minnesota as a whole. In terms of development, the two cities remain distinct in their progress, with Minneapolis absorbing new and avant-garde architecture while Saint Paul continues to carefully integrate new buildings into the context of classical and Victorian styles. The Minneapolis–Saint Paul metropolitan area fine art museums include the Minneapolis Institute of Art, the Walker Art Center, and the Frederick R. Weisman Art Museum. The Minnesota Orchestra and the Saint Paul Chamber Orchestra are full-time professional musical ensembles. The Guthrie Theater moved into a new building in 2006 overlooking the Mississippi River. The Minnesota Fringe Festival is an annual celebration of theatre, dance, improvisation, puppetry, kids' shows, visual art, and musicals. The Public Radio program A Prairie Home Companion, hosted by Minnesota native Garrison Keillor aired live for many years from the Fitzgerald Theater in Saint Paul. The show ended its run in 2016, with its successor Live from Here also airing from the same venue. With regards to ethnicity, the metropolitan area is predominantly white, with every county having at least 70% of its population coming from that background. However, the area is gradually becoming more diverse over time. 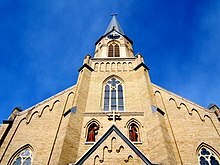 Minneapolis–Saint Paul is also a major center for religion in the state, especially Christianity. The state headquarters of five major Christian churches are found here: the Roman Catholic Archdiocese of Saint Paul and Minneapolis, the Episcopal Diocese of Minnesota, the Presbyterian Synod of Lakes and Prairies, and The Church of Jesus Christ of Latter-day Saints (LDS Church). The Presbyterian and LDS churches both have missions in Saint Paul, Minneapolis, and Bloomington as well as the Orthodox Church in America. The Twin Cities are home to several synagogues serving the Jewish population, which is concentrated in the western Minneapolis suburbs of Golden Valley, St. Louis Park, Plymouth and Minnetonka. There is also a Hindu temple located in the Twin Cities suburb of Maple Grove. A recent influx of immigrants from Laos and Northern Africa has brought many more religions to the area. There are several Islamic Masjids in the area. There is a temple for the religion of Eckankar in the suburb of Chanhassen known as the Temple of Eck. In addition, many Hmong and Tibetan Buddhist peoples live in Saint Paul; a Hmong Buddhist temple opened in suburban Roseville in 1995. The LDS St. Paul Minnesota Temple opened in Oakdale, a suburb east of Saint Paul, in 2000. There are several very strong Unitarian Universalist communities such as the First Unitarian Society of Minneapolis, as well as several Pagan and Buddhist groups. 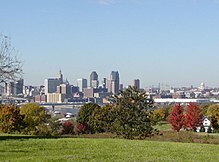 The cities of Saint Paul and Minneapolis have been called Paganistan due to the large numbers of Pagans living there. There are an estimated 20,000 Pagans living in the Twin Cities area. Minneapolis is where the Billy Graham Evangelistic Association started and was its home for more than fifty years. The Twin Cities is one of thirteen American metropolitan areas to have teams in all four major professional sports — Baseball (MLB), Football (NFL), Basketball (NBA) and Ice Hockey (NHL). Including Major League Soccer (MLS), it is one of ten metro areas to have five major sports. To avoid favoring either of the Twin Cities, most teams based in the area use only the word Minnesota in their name, rather than Minneapolis or Saint Paul. Minneapolis was the site of two Super Bowls - Super Bowl XXVI in 1992 and Super Bowl LII in 2018. It was the farthest north that a Super Bowl has ever been played. The World Series has been played in the Twin Cities three times - 1965, 1987 and 1991 as well as three Major League Baseball All-Star Games - 1965, 1985 and 2014. All-Star games in the National Hockey League were hosted in 1972 and 2004, the National Basketball Association in 1994 and the Women's National Basketball Association in 2018. The Stanley Cup Finals have been played in the Twin Cities twice - 1981 and 1991 as well as the NHL Stadium Series played host to a game in 2016. The Final Four Men's National College Athletics Association (NCAA) basketball tournament has been hosted by Minneapolis four times - 1951, 1992, 2001 and 2019 and Women's one time - 1995. The women's tournament will return to Minneapolis in 2022. Major golf tournaments hosted in the Twin Cities include - US Open - 1916, 1930, 1970, 1991; US Women's Open - 1966, 1977, 2008; PGA Championship - 1932, 1954, 2002, 2009; Walker Cup - 1957; Solheim Cup - 2002 and the Ryder Cup - 2016. The Ryder Cup is scheduled to return in 2028. The 1998 World Figure Skating Championships was held at Target Center in Minneapolis. The 2017 and 2018 X Games were held in Minneapolis and will return for 2019 and 2020. The annual Twin Cities Marathon is held in the fall with a course running through Minneapolis and Saint Paul. Minneapolis was the birthplace of Rollerblade and is a center for inline skating, as well as home to the most golfers per capita of any city in the U.S. Additionally, water skiing got its start on Lake Pepin, a lake southeast of the metropolitan area, located in the Mississippi River about 50 miles (80 km) downstream from Saint Paul. Some other sports teams gained their names from being in Minnesota before relocating. The Los Angeles Lakers get their name from once being based in Minneapolis, the City of Lakes. The Dallas Stars also derived their present name from their tenure as a Minnesota team, the Minnesota North Stars. The 2008 Republican National Convention was held at the Xcel Energy Center in Saint Paul. Minneapolis and Saint Paul submitted combined bids to host the 2008 Democratic National Convention and the Republican National Convention. Minneapolis was host to the 1892 Republican National Convention. The Minneapolis–Saint Paul area is home to 18 of Minnesota's 19 Fortune 500 headquarters - UnitedHealth Group, Target, Best Buy, CHS, 3M, US Bancorp, Supervalu, General Mills, Land O'Lakes, Ecolab, CH Robinson Worldwide, Ameriprise Financial, Xcel Energy, Thrivent Financial, Mosaic, Patterson, Securian Financial and Polaris. A number of private companies are also headquartered in the Twin Cities area, including Cargill, the country's largest private company, Carlson, Radisson Hotel Group, Mortenson, Holiday Stationstores, and Andersen. Foreign companies with U.S. headquarters in the Twin Cities include Aimia, Allianz, Canadian Pacific, Coloplast, Medtronic, Pearson VUE, Pentair and RBC. The Twin Cities's economy is the 13th largest in the U.S. and ranks second in the Midwest. The Minneapolis–Saint Paul area also ranks as the second largest medical device manufacture center in North America and the fourth-biggest U.S. banking center, based on total assets of banks headquartered in the metro area, ranking behind New York, San Francisco, and Charlotte, N.C. metropolitan areas. Owing to its northerly latitude and inland location, the Twin Cities experience the coldest climate of any major metropolitan area in the United States. However, due to its southern location in the state and aided further by the urban heat island, the Twin Cities is one of the warmest locations in Minnesota. The average annual temperature at the Minneapolis–Saint Paul International Airport is 45.4 °F (7.4 °C); 3.5 °F (1.9 °C) colder than Winona, Minnesota, and 8.8 °F (4.9 °C) warmer than Roseau, Minnesota. Monthly average daily high temperatures range from 21.9 °F (−5.6 °C) in January to 83.3 °F (28.5 °C) in July; the average daily minimum temperatures for the two months are 4.3 °F (−15.4 °C) and 63.0 °F (17.2 °C) respectively. Precipitation averages 29.41 inches (74.7 cm) per year, and is most plentiful in June (4.34 inches (11.0 cm)) and February (0.79 inches (2.0 cm)) the least so. The greatest one-day rainfall amount was 9.15 inches (23.2 cm), reported on July 23, 1987. The city's record for lowest annual precipitation was set in 1910, when 11.54 inches (29.3 cm) fell throughout the year; coincidentally, the opposite record was set the following year, which observed a total 40.15 inches (1,020 mm). At an average of 56.3 inches (1,430 mm) per year, snowfall is generally abundant (though some recent years have proved an exception). The Twin Cities area takes the brunt of many types of extreme weather, including high-speed straight-line winds, tornadoes, flash floods, drought, heat, bitter cold, and blizzards. The costliest weather disaster in Twin Cities history was a derecho event on May 15, 1998. Hail and Wind damage exceeded $950 million, much of it in the Twin Cities. Other memorable Twin Cities weather-related events include the tornado outbreak on May 6, 1965, the Armistice Day Blizzard on November 11, 1940, and the Halloween Blizzard of 1991. In 2014, Minnesota experienced temperatures below those in areas of Mars when a polar vortex dropped temperatures as low as −40 °F (−40 °C) in Brimson and Babbitt with a windchill as low as −63 °F (−53 °C) in Grand Marais. The four tallest buildings in the area are located in downtown Minneapolis. Today there is some contention over exactly which building is the tallest—most Minnesotans would immediately think of the IDS Center if queried on the point, although most sources seem to agree that Capella Tower is slightly taller. But in early 2005, it was found that the IDS Center is taller by a 16-foot (5 m) washroom garage on top, which brings its total height to 792 feet (241 m). Capella Tower and the Wells Fargo Center only differ in height by a foot or two, a rather negligible amount. Buildings have gone up and been torn down rapidly across the region. Some city blocks have been demolished six or seven times since the mid-19th century, and will undoubtedly reach an eighth or ninth cycle in short order. No single architectural style dominates the region. Instead, the cities have a mish-mash of different designs, although structures from a few eras stand out. There were once a great many stone buildings constructed in the Richardsonian Romanesque style (or at least Romanesque-inspired variants). Minneapolis City Hall is one prominent example of this, though buildings of all types—including personal residences such as the James J. Hill House—were similarly designed. A few decades later, Art Deco brought several structures that survive today, including St. Paul City Hall, the Foshay Tower, and the Minneapolis Post Office. The style of buildings in the two cities varies greatly. In Minneapolis, the trend has been buildings with sleek lines and modern glass facades while Saint Paul tends to follow a more traditional style of buildings so as to better accompany its older structures. Saint Paul and Minneapolis in particular went through some massive urban renewal projects in the post-World War II era, so a vast number of buildings are now lost to history. Some of the larger and harder to demolish structures have survived. In fact, the area might be signified more by bridges than buildings. A series of reinforced concrete arch spans crossing the Mississippi River were built in the 1920s and 1930s. They still carry daily traffic, but remain pleasing to the eye despite their age (a number have undergone major repair work, but retain the original design). Several of the bridges are listed on the National Register of Historic Places. They include the 10th Avenue Bridge, Intercity Bridge (Ford Parkway), Robert Street Bridge, and the longest, the 4119 ft (1255 m) Mendota Bridge next to Fort Snelling. The area is also noted for having the first known permanent crossing of the Mississippi. That structure is long gone, but a series of Hennepin Avenue Bridges have been built since then at the site. Both downtowns have extensive networks of enclosed pedestrian bridges known as skyways. In the 20th century, the Twin Cities area expanded outward significantly. Automobiles made it possible for suburbs to grow greatly. The area now has a number of freeways to transport people by car. The area incorporates a large number of traffic cameras and ramp meters to monitor and manage traffic congestion. There is some use of HOV (high-occupancy vehicle) express lanes, which is becoming much more common. In order to use an express lane, you need to own a MNPASS or have multiple people in the car. MNPASS rates are determined by the amount of traffic on the road and/or the time of day. During non-peak times, the MNPASS express lanes are open to all traffic. Interstate 94 comes into the area from the east and heads northwest from Minneapolis. Two spur routes form the I-494/I-694 loop, and I-394 continues west when I-94 turns north. Additionally, Interstate 35 splits in Burnsville in the southern part of the Twin Cities region, bringing I-35E into Saint Paul and I-35W into Minneapolis. They join together again to the north in Columbus, (just south of Forest Lake) and continue to the highway's terminus in Duluth. This is one of only two examples of an Interstate highway splitting off into branches and then rejoining into one again; the other split occurs in Dallas-Fort Worth, where I-35 splits into I-35E for motorists going to Dallas and I-35W for traffic heading into Fort Worth. The main airport in the region is Minneapolis–Saint Paul International Airport (MSP), which is a major hub for Delta Air Lines. The airport is also the main hub and operating base for Sun Country Airlines. There are six smaller (relief) airports in the area which are owned and operated by the Metropolitan Airports Commission (the same agency operates the main MSP airport). Some people even commute by air to the Twin Cities from the northern part of the state. Metro Transit, by far the biggest bus service provider in the area, owes its existence to the old streetcar lines that ran in the area. Metro Transit provides about 95% of the public transit rides in the region with over 900 buses, although some suburbs have other bus services. The University of Minnesota, Twin Cities operates a free bus system between its campuses. This system includes the Campus Connector Bus Rapid Transit line which travels between the Minneapolis and Saint Paul Campuses by a dedicated bus line, and throughout the two campuses on normal access roads. The METRO Blue Line LRT (light rail) began operations in June 2004, connecting downtown Minneapolis, Minneapolis–Saint Paul International Airport and the Mall of America in Bloomington. It was followed by the METRO Red Line BRT (bus rapid transitway) in 2013 connecting the Mall of America with Lakeville along Cedar Avenue through the southern suburbs. The METRO Green Line LRT connecting downtown Minneapolis, the University of Minnesota campus and downtown Saint Paul along University Avenue opened in June 2014. All three lines are operated by Metro Transit. Additionally, the Northstar Line commuter rail line connecting Minneapolis with Big Lake opened in November 2009; the line may be extended to St. Cloud as ridership numbers warrant. The Minneapolis–Saint Paul area has been criticized for inadequate public transportation. Compared to many other cities its size, the public transportation system in the Minneapolis–Saint Paul area is less robust. As the metropolitan area has grown, the roads and highways have been updated and widened, but traffic volume is growing faster than the projects needed to widen them, and public transportation has not expanded enough to commensurate with the population. The Minneapolis–SSaint Paul metropolitan area is ranked as the fifth worst for congestion growth of similar-sized U.S. metropolitan areas. [dead link] Additional lines and spurs are needed to upgrade public transportation in the Twin Cities. Plans are underway for Green Line extension connecting downtown Minneapolis to the southwest suburb of Eden Prairie. A northwest LRT (Blue Line extension) along Bottineau Boulevard is being planned from downtown Minneapolis to Brooklyn Park. The METRO Orange Line BRT will open in 2019, connecting downtown Minneapolis with Lakeville to the south along I-35W. The METRO Gold Line BRT is planned to connect downtown Saint Paul to the eastern suburbs within the next few years. The Twin Cities have two major daily newspapers: the Star Tribune and the Saint Paul Pioneer Press. Additionally, the Minnesota Daily serves the University of Minnesota's Twin Cities campus and surrounding neighborhoods. There is one general-interest neighborhood weekly newspaper still in the cities: The East Side Review, devoted to the 90,000 residents in the eastern third of Saint Paul. Other weekly papers are devoted to specific audiences/demographics including City Pages. The region is currently ranked as the 15th largest television market according to Nielson Media Research. Three duopolies exist in the Twin Cities: Twin Cities PBS operates both KTCA and KTCI, Hubbard Broadcasting (built by Stanley E. Hubbard) owns both ABC affiliate KSTP-TV and independent station KSTC-TV, and Fox Television Stations operates both Fox owned-and-operated station KMSP-TV and MyNetworkTV O&O WFTC. Diversified from radio, KSTP-TV became the first television channel to air in the region with a show reaching 3,000 television sets in 1948, and the 17th station to broadcast in the U.S. The only station with its main studios in Minneapolis is CBS O&O WCCO, while Saint Paul is host to KSTP/KSTC, KTCA/KTCI, and CW affiliate WUCW. NBC affiliate KARE has a sprawling broadcasting complex in west suburban Golden Valley. KMSP is located in southwest suburban Eden Prairie. Other stations are located in the suburbs. For much of the last two decades, WCCO and KARE have shared in having the most popular evening newscasts of the area channels. On the other end, KSTP has struggled to maintain ratings on its news programs. KMSP has had a 9 o'clock newscast since at least the early 1990s when it was an independent channel. Several television programs originating in the Twin Cities have been aired nationally on terrestrial and cable TV networks. KTCA created the science program Newton's Apple and distributes a children's program today. A few unusual comedic shows also originated in the area. In the 1980s, KTMA (predecessor to WUCW) created a number of low-budget shows, including cult classic Mystery Science Theater 3000. The short-lived Let's Bowl started on KARE, and PBS series Mental Engineering originated on the Saint Paul cable access network. The radio market in the Twin Cities is ranked 15th by Nielsen in 2018, similar to its TV market size. In November 2018, the top five morning radio shows in the area were all FM stations: KSTP, KXFN, KQQL, KDWB, and KXXR. Three of the top five morning radio stations are owned by iHeartRadio. Most radio stations broadcast on air, and can be heard as well over the internet, as live streams from the web site of each radio station. KSTP, a television station, also has radio stations, with pop music format on FM and ESPN Radio on AM. KSTP-AM and FM are owned by Hubbard Broadcasting. In 1985, Hubbard – valued at $400 million – was one of the larger corporate media companies in the United States; in 2005, valued at US$1.2 billion, Hubbard is a fairly small major-market media operation. The Twin Cities have a mix of commercial and non-commercial radio stations. The city's market is dominated by iHeartRadio which operates seven stations. Two small, independent stations are award winners — KUOM operated by the University of Minnesota and KFAI public access radio in Cedar Riverside. Minnesota Public Radio (MPR) airs on KNOW 91.1 FM, KSJN 91.5 FM and KCMP 89.3 FM, with separate programs on each station. It is a major player in the state and across the country, first known across the U.S. for the variety show A Prairie Home Companion, which ceased production in 2016. Doing business under the name American Public Media, the company is the second largest producer of National Public Radio content, behind National Public Radio (of which MPR is an affiliate). KCMP is also known as The Current. The United States Navy currently has one ship named for the region, USS Minneapolis–Saint Paul, a Los Angeles-class submarine launched in 1983. Previously, two sets of two ships each had carried the names USS Minneapolis and USS Saint Paul. ^ a b "U.S. Decennial Census". United States Census Bureau. Archived from the original on May 12, 2015. Retrieved October 15, 2014. ^ a b "Historical Census Browser". University of Virginia Library. Retrieved October 15, 2014. ^ "Population of Counties by Decennial Census: 1900 to 1990". United States Census Bureau. Retrieved October 15, 2014. ^ "Census 2000 PHC-T-4. Ranking Tables for Counties: 1990 and 2000" (PDF). United States Census Bureau. Retrieved October 15, 2014. ^ Xiong, Yia. Minnesota cities. ^ "St. Paul travel guide". Archived from the original on 2016-03-03. Retrieved 2016-02-06. ^ Robb, Edwin G. (1996). Afton Remembered. Afton Historical Society Press. ISBN 978-0963933874. ^ Orfield, Jr., Myron (1997). "It Couldn't Happen Here...". Metropolitics : a regional agenda for community and stability. Washington DC: Brookings Institution. ISBN 0-8157-6640-8. ^ Neset, Ray (July 20, 2007). "Plymouth Avenue 40 Years Later". Minneapolis Mirror. ^ Abercrombie, Thomas J.; Griffiths, Annie (November 1980). "A Tale of Twin Cities, Minneapolis and St. Paul". National Geographic. Vol. 156 no. 5. pp. 664–691. ^ "Update of Statistical Area Definitions and Guidance on Their Uses" (pdf). Office of Management and Budget. November 20, 2008. Retrieved March 8, 2015. ^ "Revised Delineations of Metropolitan Statistical Areas, Micropolitan Statistical Areas, and Combined Statistical Areas, and Guidance on Uses of the Delineations of These Areas" (pdf). Office of Management and Budget. February 28, 2013. Retrieved March 8, 2015. ^ "Our Estimates". MN State Demographic Center. Retrieved 15 October 2018. ^ a b Mary Lethert Wingerd (February 2007). "Separated at Birth: The Sibling Rivalry of Minneapolis and St. Paul". OAH Newsletter. Organization of American Historians. Archived from the original on July 7, 2012. ^ "Census-Bred Bitterness; St. Paul and Minneapolis Have Locked Horns". New York Times. June 21, 1890. ^ "They Want Hay's Scalp. ; St. Paul Residents Are Going to Descend Upon Washington". New York Times. June 22, 1890. ^ "Fighting over the Census; St. Paul Jealous of Minneapolis and Charges Fraud". The New York Times. July 23, 1890. ^ "May 10, 1965: Minneapolis falls an hour behind St. Paul". Star Tribune. ^ "How to fringe". Fresh Art Delivered Daily. Minnesota Fringe Festival. 2006. Archived from the original on 2006-11-14. Retrieved 2006-11-22. ^ "Actively Moving America to Better Health" (PDF). American College of Sports Medicine. 2011. Retrieved May 23, 2011. ^ "Health and Community Fitness Status of the 50 Largest Metropolitan Areas" (PDF). American College of Sports Medicine (ACSM) American Fitness Index. 2012. Retrieved June 29, 2012. ^ Douglas, Phil; Blumer, Ward. "Minnesota Facts and Trivia". 50States.com. Retrieved December 16, 2018. ^ "A Look Back". USA Water Ski & Wake Sports Foundation. Retrieved December 16, 2018. 1922: Ralph Samuelson designed the first water skis from two pine boards and successfully skied on Lake Pepin in Lake City, MN. ^ "Gross Domestic Product by Metropolitan Area, 2015". Retrieved 7 July 2016. ^ "Analysis by Crossborder Group Finds Tijuana #1 City in North America for Medical Device Manufacturing Employment". Tijuana Economic Development Corporation. Retrieved August 14, 2011. ^ Roberts, Deon; Rothacker, Rick (May 24, 2017). "Goodbye bragging rights: Charlotte's no longer the No. 2 U.S. banking center". Charlotte Observer. Retrieved July 6, 2017. ^ "Minneapolis Minnesota". TrekkerTime.com. Retrieved 2007-05-07. ^ "History of the NWS in the Twin Cities". National Weather Service. November 9, 2005. Retrieved 2007-05-07. ^ "Climatography of MSP". National Climatic Data Center. 1971–2000. Archived from the original on 2012-07-09. ^ "Temperature Summary – 215435 MINNEAPOLIS WSFO AP, MN". Archived from the original on 2014-05-22. ^ "Precipitation Summary – 215435 MINNEAPOLIS WSFO AP, MN". Archived from the original on 2014-05-19. ^ "Snowfall Summary – 215435 MINNEAPOLIS WSFO AP, MN". Archived from the original on 2014-04-19. ^ Scott, Woelm (June 30, 2006). "Top 10 Minnesota Severe Weather Events 1990–1999". Metro Skywarn. Archived from the original on March 28, 2007. Retrieved 2007-05-07. ^ "Growing Season Summary – 215435 MINNEAPOLIS WSFO AP, MN". Archived from the original on 2013-07-09. ^ "USNA – USDA Plant Hardiness Zone Map:North-Midwest US". Archived from the original on 2014-06-29. Retrieved 2014-05-19. ^ a b Millett, Larry (1992). Lost Twin Cities. St. Paul, Minnesota: Minnesota Historical Society. ^ Larson, Paul Clifford; Martin, Judith (1988). Larson, Paul Clifford (ed.). The Spirit of H.H. Richardson on the Midland Prairies. Ames, Iowa: Iowa State University Press. ^ "35W bridge collapses over Mississippi River, cars in the water". St. Paul Pioneer Press. 2007-08-01. Retrieved 2007-08-01. ^ "35W bridge over Mississippi collapsed". 5 EYEWITNESS NEWS. 2007-08-01. Retrieved 2007-08-01. ^ "Metropolitan Council - Central Corridor transit FAQ". Archived from the original on 12 June 2011. Retrieved 3 July 2011. ^ Midwest Regional Rail Initiative. Retrieved June 24, 2008. ^ "Metropolitan Council - Central Corridor transit FAQ". Archived from the original on June 12, 2011. Retrieved 3 July 2011. ^ Minneapolis Public Library (2001). "A History of Minneapolis: Radio and Television". Archived from the original on 2007-04-19. Retrieved 2007-05-10. ^ "Nielsen Audio Ratings". Radio, Online. 2018. Retrieved December 18, 2018. ^ "Forum: Top 20 US Radio Markets". Retrieved December 16, 2018. ^ "#15 Minneapolis-St. Paul November 2018 Portable People Meter Ratings". November 29, 2018. Retrieved December 16, 2018. ^ iBiquity Digital Corporation (2007). "HD Radio – Minnesota". Archived from the original on September 27, 2007. and "Independent Public Radio". 2006. Archived from the original on 2007-06-29. Retrieved 2007-05-10. ^ "Garrison Keillor Hosts Final A Prairie Home Companion Episode". The Guardian. July 2, 2016. Retrieved December 16, 2018. This page was last edited on 10 April 2019, at 02:09 (UTC).